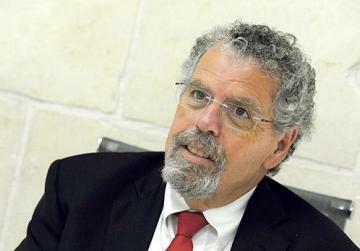 With the American University of Malta obtaining a licence to operate last week, Kurt Sansone met provost John Ryder at his office in Cospicua. Cospicua’s Dock One was basking in the sun with a handful of people sitting down on the benches along the shore. The recently-restored façade of the British building glowed as works continued inside to turn the large stores into university classrooms. In Gavino Gulia Square, a stone’s throw away, elderly men drank tea at one of the bars at the heart of the historic town. 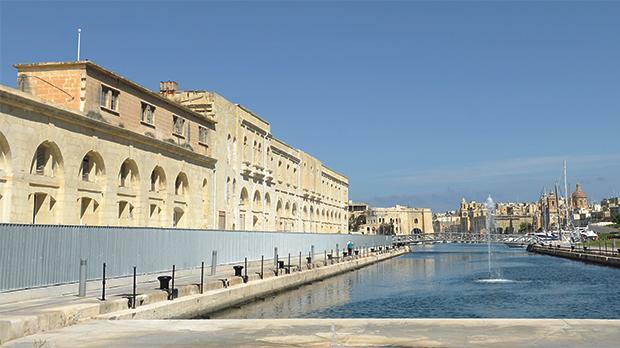 Change is set to come to this area on August 28 next year when the British buildings along the dock will start being used as a campus by the American University of Malta. AUM officially obtained its university licence last week and its provost (rector) John Ryder has set the start of the first academic year for August 2017. He expects some 330 students in the first intake. I meet him at his office in the Guard House building near what used to be the red dockyard gate. The building had originally been restored to house a police station before the government decided to allocate the area to the Sadeen Group for its university project. He acknowledges the scepticism when I query AUM’s future as a university, given that Sadeen has absolutely no track record in the running of tertiary institutions. Is this a five-year experiment that will fizzle out, I ask. It is quite a tall order. AUM starts from scratch with no affiliation to any established university, which explains the lengthy licensing process it had to undergo at the hands of the National Commission for Further and Higher Education. Even so, many have remained sceptical about the intentions of a Jordanian company with no university background wanting to set up a campus for 4,000 students on two prime sites in Cospicua and Marsascala. Some have even suggested AUM will simply be a degree-churning mill for those who pay. “No chance; not while I am here. Not while Sadeen is here… but I can understand people who say that,” Prof. Ryder says. However, he acknowledges that simply talking about AUM’s resolve to be a centre of excellence will not convince the sceptics. “We have to earn people’s respect… the only way to do so is to prove what we are saying by the way we act. People who have reason to be suspicious of us are going to be suspicious until we demonstrate otherwise,” he says. A philosophy professor, with 25 years’ experience in university administration, Prof. Ryder comes to Malta from the Ameri­can University of Ras Al Khaimah in the United Arab Emirates. The Ras Al Khaimah institute has no links to the Sadeen Group despite the use of the descriptor ‘American University’. The curriculum was drawn up by the Chicago-based DePaul University, which developed AUM’s degree programmes under contract with Sadeen. The other American link is South Caro­lina’s Clemson University, which was roped in as an external quality assurance advisory partner, as requested by the NCFHE. “Clemson will also develop additional curricula in engineering, and hopefully architecture, because DePaul does not offer these courses,” he says. And for the medium term, AUM will also seek accreditation with the New England regional authority in the US, the same body that accredits world-renowned universities like Harvard and Yale. Prof. Ryder says student recruitment is likely to be from the Middle East and North Africa initially but AUM has its sights set on markets beyond the region. Eastern Europe, Russia and China are other potential markets, he adds. Outside the building, life picks up as residents go about their daily routines. Prof. Ryder says the Cospicua campus will not be a gated community and it is his intention to reach out in some way or another. An idea he floats is to have the university librarian explore options to share resources with the schools in the area. Given that AUM’s business school will be situated at the Cospicua campus, Prof. Ryder says another option could be to have an incubator for small businesses from the neighbourhood. The Dock One area will definitely become busier with students around. For the old-timers it may just be a remote reminder of a time when the town was bustling with activity of a different kind. But for AUM, it will take some time to polish that “diamond” and convince sceptics that its presence in Malta as a university is for the long term. When the NCFHE offered Sadeen a university licence it did so with a list of conditions. It took Sadeen more than two months to reply. Why? I don’t speak for Sadeen. I was not a party to those meetings. What I can tell you is that we agreed to the conditions, academic and otherwise. I think some of the time was figuring out how to fulfil the conditions. The corporation had to think this through. So it took time but we met the conditions and now we are going to build the university. According to the land transfer contract signed with the government, the first student intake was to happen this October. That has been delayed by a year. Isn’t this in breach of the contract? The expectation to have students at the beginning of October this year assumed the receipt of a licence and accreditation in sufficient time to be able to do that… given that we received the licence last week, two weeks is not enough time to generate a serious university. Aside from creating the faculties and recruiting the students, which takes some time, the rhythm of academic job hunting is almost a year-long process in the US, and it begins next month when people look for jobs for the following academic year. Will the Cospicua campus be ready by then? The plan is to have this building [British building] ready for instruction. All our classes will be here. The Knights building [also in Dock One] will be ready in a year or two while the campus at Marsascala will take two to three years from now to be ready.